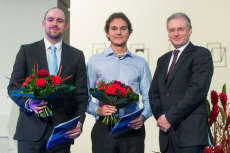 On November 29th, Sören Simon Petersen was honored with the “Jung Scholar Award” from the German Institute for Standardization for his work on “The Interrelation of Patents and Standards in the Strategic Technology- and Innovation Management”. Mr. Petersen analyzed how companies can use patenting and formal standardization for their technology in innovation management. He showed that patenting and formal standardization can be regarded as complementary instruments and that the interrelation of both has become increasingly important. The award comes with 1.000 Euros prize money.